The Romans had one of the greatest armies in history. They conquered much of the known world and had some of the best parties of any empire. How did they do it all? Well, with proper headwear of course. The Italic "D" Roman helmet may have been used by the famed Praetorian guard (the Emperor's posse) as a sign of distinction and honor. It's fancy enough. Screaming eagles on top, temples on the ear flaps, ridged brass on the back and sides. This is one flashy helmet. It's made from 16-gauge steel, reinforced and decorated with strong bands of brass and steel. 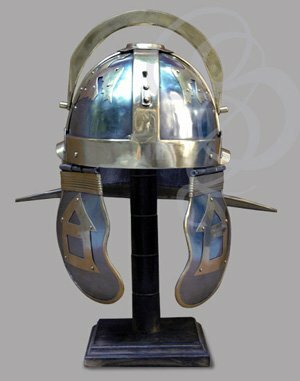 It features the standard wide rear "brim" of the Italic and Gallic helmets, reinforced, trimmed and decorated with brass. The ear flaps are crafted in the same way, with brass trim work and brass temple pictographs riveted in place. The bowl is a durable 16-gauge steel with a thick sheath of brass around the base. 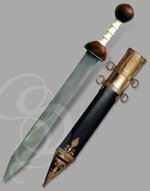 Four strips of rugged brass extend from this sheath and meet at the crest, supported by the crest holder on top. A horsehair crest (not included) can be inserted in to the top to make it a ceremonial or cavalry style helmet. This is probably the flashiest of the Roman helmet styles in history. Our smiths have captured the elegance and strength of this famous helmet and offer it with or without a leather liner. The liner allows this helmet to be worn straight out of the box, with leather chin straps to tie it on. Whether you get it with the liner or without, you still get a beautiful, polished hardwood display stand to showcase this item and a jar of armor oil to keep this helmet in perfect shape. We'll also throw in a genuine speck of dust that was once breathed in and expelled by Julius Caesar himself (while supplies last ;) ). Material: 16-Gauge High Carbon Steel with Brass Accents and Trim. Leather Liner Optional. Polished Hardwood Display Stand also Included.